So, since I have been so good lately about posting on time I decided I could allow myself to do another regular weekly post! I've been planning this for a while, but have just never gotten around to actually doing it. My new segment is called I Spy! Slightly cheesy I know, but I'm in a cutesy mood right now. I Spy is a weekly segment that will preview any new book (and occasionally movie or other random item) that I think is noteworthy or am intrigued by. Mostly it will be books to watch out for! New and exciting upcoming reads by new authors and old alike. An invisible, uncrossable physical barrier encloses the Unified States. 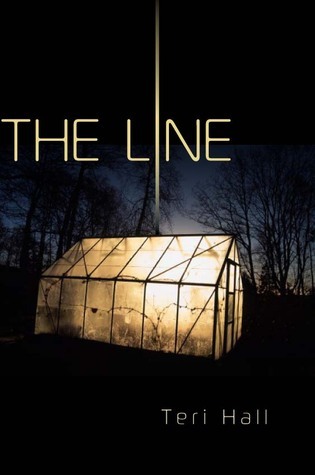 The Line is the part of the border that lopped off part of the country, dooming the inhabitants to an unknown fate when the enemy used a banned weapon. It’s said that bizarre creatures and superhumans live on the other side, in Away. Nobody except tough old Ms. Moore would ever live next to the Line. Nobody but Rachel and her mother, who went to live there after Rachel’s dad died in the last war. It’s a safe, quiet life. Until Rachel finds a mysterious recorded message that can only have come from Away. The voice is asking for help. Who sent the message? Why is her mother so protective? And to what lengths is Rachel willing to go in order to do what she thinks is right? Does that not sound amazing? Post-apocalyptic novels anyone? Woot woot! It truly sounds like an amazing story and I'm eagerly awaiting this book. I shall have to go snoop at my local (and only) bookstore and steal it off the shelf. Muwahahahahaha. Relax I'm not a shoplifter. Just a little over eager. Keep a look out for my next find!